The New York Post indicated that the Mets remain interested in signing Yoenis Cespedes to a four year contract but a fifth year could wind up being a deal breaker for the team. We can spend all day speculating about the actual reason for this rumored line in the sand. Many fans still think the Wilpons have no intention of signing Yo and are just trying to give the impression that they made their best effort to keep him here. It’s also possible that this is all just part of the negotiating process for Sandy Alderson. The Mets may just be leaking this news to the media purely as a negotiating tactic. In the end the Mets may cave and give Cespedes exactly what he wants because they recognize how important he is to the team. The Cespedes negotiations have implications that go beyond simply losing or retaining the most valuable bat on the team. Many fans will see the outcome as a signal for the direction of the franchise. If Yo leaves, some Mets fans will see that as confirmation of their worst fears regarding the Wilpons’ willingness to spend. On the contrary if he signs a multi-year deal with the Mets, some fans will see this as a sign that the team’s payroll is going in the right direction. 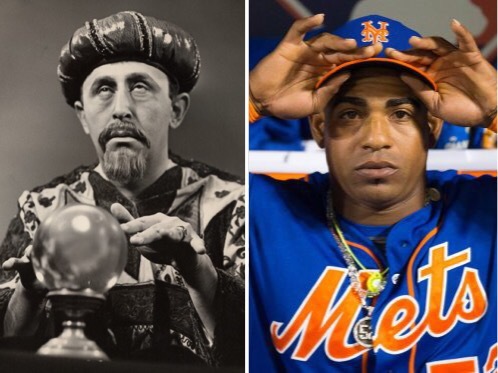 That being said, many baseball “psychics” seem to know exactly how the Cespedes deal will turn out. I can’t tell you how many fans have talked to me or tweeted at me to state their support of a four year deal for Cespedes but not a five year deal. The baseball fans that take hard stances against giving a free agent “the extra year” always baffle me. Baseball doesn’t have a hard salary cap. The Mets’ payroll is not approaching the current MLB luxury tax threshold. So why do Mets fans have strong views on this? Do people seriously feel that a four year deal is acceptable, but a fifth year is so unreasonable that they’d rather not watch Cespedes (i.e. the most exciting baseball player in New York City) play at Citi Field? Why are some people specifically afraid of a fifth year? Do you have a crystal ball? These fans act like they know with certainty that at 35 years old Yoenis Cespedes will cease to be a productive major leaguer. At 34 he’ll be fine. But at 35? He’s done! In my opinion, you can make one of two arguments when it comes to Cespedes. Argument 1: Don’t sign Yo and instead spread out that money across multiple players to improve the team. If you feel this way then fine. I can think of many ways to spend the 25-30 million in annual salary in lieu of signing Cespedes. Argument 2: Go all out to sign Yo to a four to six year deal and hope he maintains his power and health over the course of the deal. I understand that there’s uncertainty surrounding a contract that takes a player into his mid 30’s. But arguing over the merits of a four or five or six year contract for a 31 year old player coming off the two best seasons of his career, drawing arbitrary lines in the sand is ridiculous in my opinion. Sure long-term deals can be hit or miss. Jose Reyes signed a six year deal with the Marlins at 28, and it didn’t really work out due to injuries and his off the field problems. David Wright signed an eight year deal at 29 and due to his health issues that hasn’t really worked out. On the other hand, Carlos Beltran signed a seven year deal with the Mets at 27, and he’s still going strong at 39. The four year deal we gave to Curtis Granderson has worked out thus far, and he’s 35 years old. The point is unless these baseball fortune tellers have seen Yo’s medical reports and somehow know for a fact that he’s on the path to early retirement, I don’t how they can possibly sell me on the argument that a four year deal makes sense but a five year deal is irresponsible. Speaking of multi-year deals, the Mets just announced that they have agreed to a new long-term contract with Gary Cohen. For those of you keeping track at home, the re-signing of Gary Cohen is arguably the most significant news of the Mets’ offseason other than Neil Walker accepting the qualifying offer and Eric Campbell leaving to play in Japan. I suppose it’s possible that the brass at SNY spent weeks debating whether or not to give Gary the extra year on his new contract. But when it comes to superstars like Gary, sometimes you need to go the extra mile to keep them happy.